​I once had a difficult time understanding this scripture. "How do I give thanks when the bad in life happens?? I'm not one bit thankful for any of that." 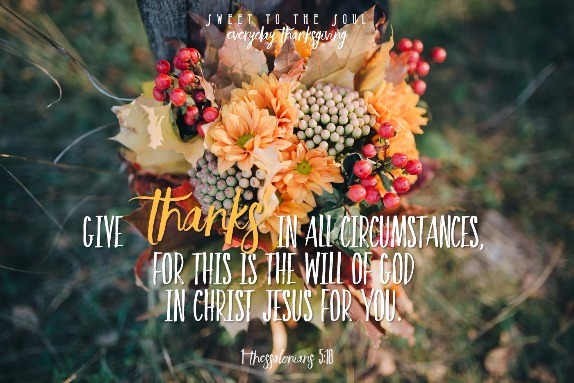 I soon realized the scripture didn't read, "Give thanks FOR all circumstances." It read, "Give thanks IN all circumstances." We all experience difficulties, or what I call the "yuck" in life. But through them, there's always something to be thankful for. More importantly, if we have the life-giving hope that's found only in Jesus, true thanksgiving naturally stems from it. Our hearts are filled with thanksgiving, all because we have hope. All because we have Jesus. 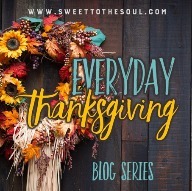 Today's blog post is part of our November blog series #EverydayThanksgiving. Today's guest blogger is the lovely Julie Lefebure. You can catch up with Julie on her blog Real Encouragement for Real Life as well as facebook and twitter. ​I’m a pretty simple gal, who finds joy in un-rushed mornings, dining on colorful Fiesta dinnerware, and breathtaking sunrises and sunsets. I can’t seem to resist a fresh, gooey chocolate chip cookie to save my life, so I’m often found walking outdoors to offset the calories. Julie, it took me awhile to see that small word IN and how it made such a difference. It's still difficult but much more attainable than giving thanks for ALL circumstances. Thank you for sharing! Oh Yes, Julie and Jana. I'm giving thanks IN this circumstance: a $490 car repair bill today! God is great, and He is faithful, and He provides. I thank Him because I'm married and have a husband who takes care of these things.. Love that scripture and graphic!